It's a little dark but still cute! 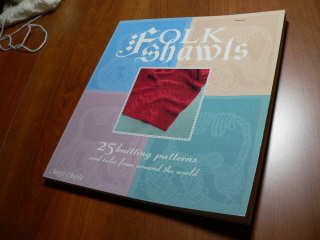 Folk Shawls, a book I've owned for awhile. During the six hour class, we worked on a lace sampler. Years ago, patterns were not written anywhere. Lace patterns were handed down in the form of a sampler like this one. The sampler consists of five patterns. I have completed three of them: from the bottom to the top, Pearl Barred Scallop, English Mesh Lace and Fir Cone. 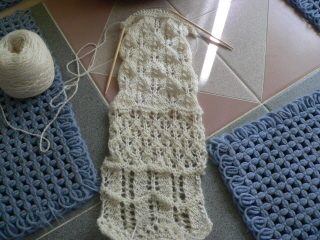 Keep in mind that lace looks quite different after it is blocked and this is a work in progress. In fact, I made a huge error on this pattern (Fir Cone) and had to rip back several rows. When Cheryl told me to do this, my face must have registered horror. I did it, though, and managed to get the knitting back on the needles and back on track. I guess it's true that you learn more from your mistakes because, despite that setback, I think this one is my favorite so far. This pattern is referred to as "fully fashioned", meaning the yarn overs and the decreases are not next to each other but separated by knit stitches, making the fabric curve or "move". Maybe that's what I like about it. Apparently, there is a difference between knitted lace and lace knitting. In knitted lace, every second row is a plain row, knit or purled. Cheryl called it a "rest" row, where your brain gets a chance to rest from paying attention to the pattern. 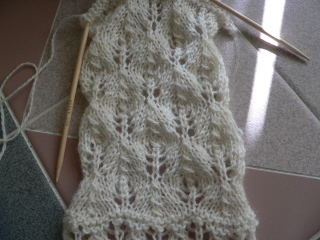 With lace knitting, there are yarn overs every row. The class was intense. 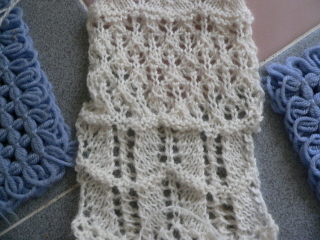 Despite Cheryl's claim that lace is nothing more than yarn overs and decreases, knitting lace is rather difficult. Sure, it's only yarn overs and decreases but it's where you put those yarn overs and decreases that makes all the difference. It was a great experience and I think I'm well on my way to learning to knit lace, something I don't think would have been possible without some hands on training and help. At the end of the class, Cheryl took a picture of the group of us holding up our samplers. 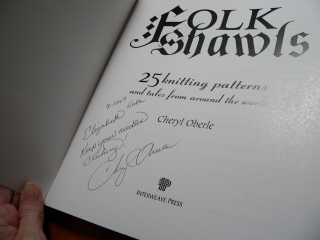 And, to be truly dorky, I asked her to sign my copy of the book. Tonight, I was at the theatre to teach knitting to the actress playing Mrs. Lovett in Sweeney Todd, still in rehearsals this week. During a scene in the show, Mrs. Lovett completes a hand knit scarf for Toby, who wears the scarf for the rest of the play. 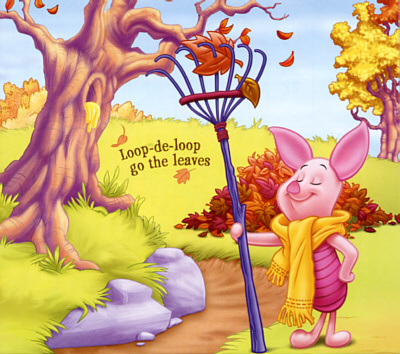 So, she has to appear to be knitting it during a song and then wrap the completed scarf around his neck. I made a completed scarf and half a scarf, still on the needles. All of this will be in a basket on her lap and she can hide the in progress knitting and remove the completed scarf, a "bait and switch" of sorts. As it turns out, the actress has wanted to learn to knit. I had planned to show her how I knit and give her enough of an idea how to fake it onstage. Instead, I wound up teaching her the knit stitch, which she caught on to very quickly, and left her practicing it. I think I may have converted a non-knitter! By the way, Sue and I will, as usual, be interpreting, this time on October 18th. I'm working again during the day tomorrow and my class starts tomorrow evening. I got the call this evening that I'm needed to sub tomorrow and went out to the garage to gather all my materials for the class, something I intended to do tomorrow during the day. I'm patting myself on the back for leaving it all so organized. Usually, when class is over, I throw all my stuff in the box until next time! I'm ready to go. 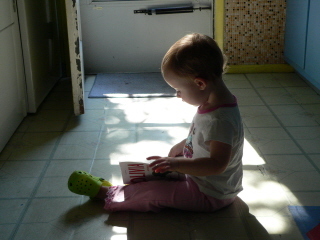 I'll have to tell my students that my 19 month old granddaughter knows how to sign and if she can learn, they can, too. The funny thing about it is that Lorelai assumes everyone knows sign. In the diner this afternoon, one of the waitresses who has seen her since she was an infant came over to say hi and Lorelai signed "eat". I explained, "She says she's going to eat." Everyone around her in the family knows what she's saying so, naturally, she expects everyone she comes in contact with to understand her. Interesting. The last time we were at the diner, Lorelai ordered for herself. Bill and I decided to get macaroni and cheese for her. "Cheese", she said. When the waiter came over and asked if we were ready, Lorelai looked up and said, "Cheese". He said, "She wants cheese?" Yes, macaroni and cheese. Orders for herself. That's my girl. When my kids were little, they would ask me, “Mommy, what do you want for Christmas?” I’d say, “Peace and quiet.” They’d look at me for several seconds and then they’d say, “No, really. What do you really want for Christmas?” This is what I wanted. 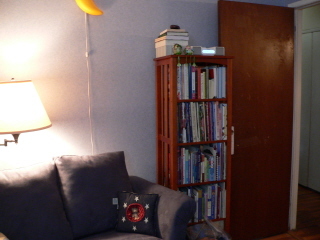 Bill calls it my sitting room, which makes the girls laugh because it sounds so old-fashioned. 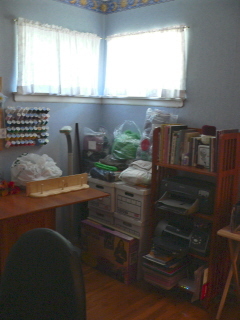 I prefer to think of it more as a workroom, a studio. 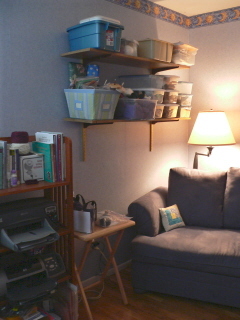 It's a place where I can finally gather all my craft tools and supplies and find something when I look for it. The craft table is a pleasure. 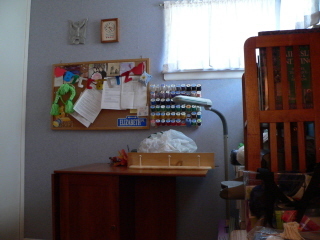 I can use it for the sewing machine or the knitting machine or I can use it as a work surface. 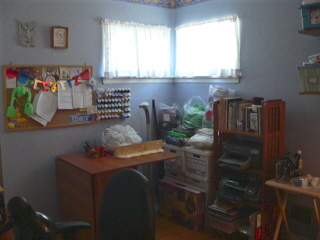 All the craft books are in one room. 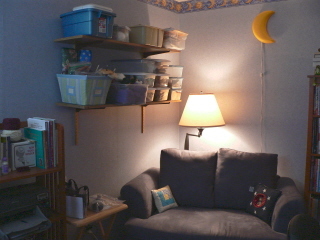 Shelves with boxes for all the craft supplies. I can find something when I'm looking for it without digging through boxes in the garage. 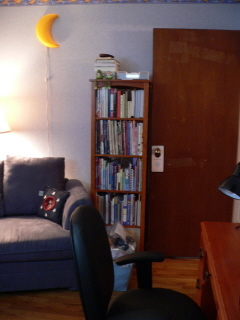 I have the two photo printers with a print server in here so I can use them with my laptop. 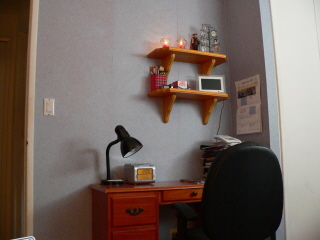 I still have one shelf to put up next to these decorative shelves. I need to polyurethane it first. I've been lamenting the lack of freelance work I've had lately. I'm about ready to get back to work, really. Thursday evening, I got a call to substitute on Friday. Yes, the first week of school. Amazing, huh? So, when I came home from work, I found three calls on the answering machine with job info, one of which is my class, which will run this semester starting next week. When it rains, it pours. The only downside to that job is that the classes are on Monday and Wednesday nights 7-9 pm and the spin guild meetings are on the third Wednesdays of the month from 6:30-10 pm. The class runs six weeks so I'll miss two, unless I just ride out there after class and catch the last half hour or 45 minutes. I might do that. I hate it when I have all this free time and still, things conflict. Dang. As the summer of 2007 winds down, here are a few pretty pictures. Lorelai and Aunt Kim under the tree. And here's a picture from our trip to Gettysburg, taken with my cell phone camera. Schools back in session. Drive carefully. 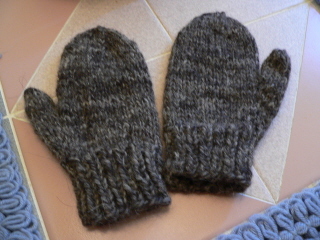 Completed llama/wool mittens. I still have to line them with fleece and I'll probably do that tomorrow. 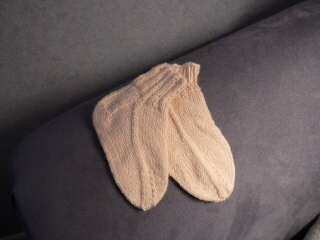 Lorelai's cream colored cotton/wool socks. They're so much fun. Usually, I knit about an inch and a half of ribbing, then switch to stockinette until it's about 6-7 inches long. 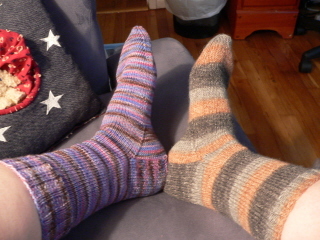 With these socks, I knit an inch and a half of ribbing and I'm ready for the heel. Sweet! I guess I can't wear them like this, huh? Hmm, I'd better get to work on these. I haven't worked on them since the spring. The purple on the left is the right color but the right? That's really not orange, more like a light brown color. I love the big wide stripes. 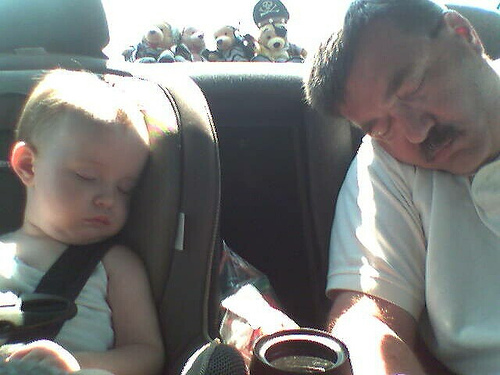 So long, summer of 2007. You sure flew by fast. Once again, I'm starting September without a job. There is the possibility of an interpreting job but time will tell. If not, I have other ideas. Not to worry. I'm thisclose to finishing a second sock for Lorelai. This yarn is perfect. It's a cotton/wool blend, which should be very comfortable. They must be comfortable. When the first sock was done, Lorelai wore it all over the house and we had to chase her to take it off! She really likes it. I wouldn't mind if she were running around at her house with the carpeting. We have all hardwood floors and ceramic tile in the bathroom. I don't want her to slip. Anyway, this yarn is also machine wash and dry making it easy care for a toddler. They're so cute. Picture forthcoming. I'm thinking of trying to dye some yarn. I have some sock yarn, also from Knit Picks, I believe, that's called "bare". It's ready to be dyed. I'm thinking of starting with kool-aid dyeing. It doesn't seem too difficult. I also have 2 ounces of Ashford wool I've been spinning. When that's done, I'd like to dye that as well and then make something for Lorelai. Two ounces won't go far. I'm thinking mittens. She was wearing my newly completed mittens today and they look like oven mitts on her! It's getting late so ta-ta for now.